Astaxanthin, a highly functional antioxidant, effective to keep the youthfulness of skin by controlling skin's stress from oxidization. Contains squalane, the purified form of squalene or shark liver oil extract. Squalane is a component of human sebum and therefore extremely well absorbed by the skin, leaving no oily residue. Skin is renewed, softened, and protected at the same time. CoenzymeQ10 - one of the coenzymes produced in body - boosts energy production and eliminates free radical. Stearyl Glycyrrhetinate, an anti-inflammatory ingredient derived from licorice, is strengthened by binding with stearic acid, which leads to the excellent anti-inflammatory effect. A mixture of human ceramide 2, 3, 6 and phytosphingosine imitates and replenishes intercellular lipid. HABA's philosophy for its skin care product line is to pursue true beauty by maximizing your skin's natural healing power. Choose from a variety of products to create your simple daily regimen: Remove dirt and impurities with HABA Cleanser Powder or Oil Cleansing (for makeup cleansing). Tone alcohol-free with G Lotion or new VC Lotion II. Then moisturize with SD Squa Dew, Squa Q10 or Squalane. Further customize your regimen with HABA Special Care products which include Fair Lady (lightening), Squa Q10, Uruoi Densetsu, 2 Way Jell, White Knight, or Umi No Houseki. 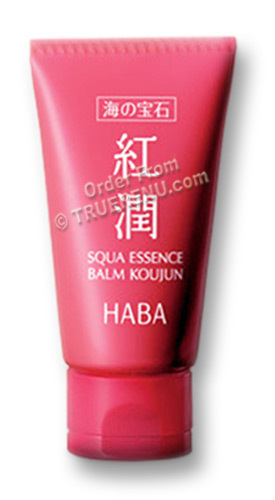 HABA Umi No Houseki Squa Essence Balm Koujoun was originally available for a limited time only... but such high demand encouraged HABA to bring it back as a regular item. It has a light feel that is never greasy, and smoothly spreads over dry areas, providing long-lasting hydration. This squalane-based paste is so light it can be applied before makeup, and safe to use even over sensitive areas caused by roughness or irritations. If you'd like to learn more about HABA, try one of the products - and toss our 10-Product Trial/Sample Set (item 4904) in your shopping cart for a luxurious way to sample many of their most popular products. Apply on areas concerned for dryness. Use an appropriate amount and thinly smooth out on face with fingertips. Ingredients: Squalane (purified squalene), dextrin palmitate, dodecane, polysilicone-1 crosspolymer, haematococcus pluvialis (a microalgae, the primary natural source for astaxanthin) oil, ubiquinone (Coenzyme Q10), ceramide 2, cermadide 3, ceramide 6 II, phytosphingosine, tocopherol, ascorbyl tocopheryl maleate, stearyl glycyrrhetinate (anti-inflammatory ingredient derived from licorice), oryza sativa (rice) germ oil, simethicone, behenyl alcohol, polyglyceryl-10 pentastearate, sodium stearoyl lactylate. Page displayed in: 0.3086 seconds.